Upon entering our office, your will be greeted by the friendly staff at Sydney Wide Chiropractic and then we have some important paperwork for you to fill out. The paperwork provides us with general information about yourself and your condition. This information helps us make a diagnosis and provide you with the appropriate treatment for your particular problem. In order to determine what your actual problem is, the Chiropractor will ask you various questions related to your condition. Next, a number of specialized tests will be performed to determine which areas are affected and to what extent. Your specific condition may require us to look at past or order new X-rays to either rule out more serious conditions or assist us in developing the most effective treatment plan for you. If significant pathology is suspected we may require further imaging to see the extent of the injury. Once finished with the examination and all appropriate studies, the Chiropractor will review the gathered information, reach a working diagnosis, and begin treatment designed to correct the cause of your problem. 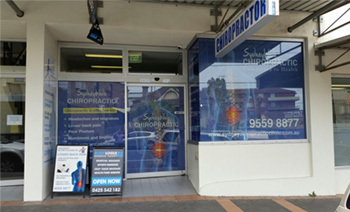 On your next visit to Sydney Wide Chiropractic will review the findings from your exam and x-rays with you so that you understand your problem and your treatment options. Chiropractic treatment primarily consists of spinal adjustments to correct Mechnical Misalignments to the Spine and peripheral joints as well as a preceding soft tissue therapy massage to relieve any muscle tension in the injured areas. Spinal adjustments are used successfully to treat a variety of different soft tissue disorders as well as a number of other health problems. Chiropractors are the only health care professionals trained to deliver the chiropractic spinal adjustment. Spinal adjustments or spinal manipulation is the process of applying a quick but gentle pressure to "mal-aligned" vertebrae in a corrective manner. The adjustments are not and should not be painful. We also offer low force techniques and instrument operated techniques such as Activator and Arthrostim for people that dont prefer spinal manipulation. Physical therapy modalities are special services that we also offer that include TENS, intersegmental traction, flexion distraction, hydro-collator packs, and trigger point therapy. These are used for soft tissue injuries, including disc injuries, inflammatory, spasm, and fixations and any one of these modalities are also part of the treatment at Sydney Wide Chiropractic which lasts up to 30mins. Exercise rehabilitation is an additional special service that can be prescribed to the patient that includes specific exercises to target those muscles that support the injured regions of the spine. Prior to leaving the Chiropractic Clinic patients will be given instructions on certain activities or procedures to be conducted at home. This may include ice or heat application instructions, avoidance of certain activities or positions, as well as home exercises and/or stretches. You will be given a convenient appointment time by your Chiropractor for your follow-up visits. Often rehabilitative exercises are utilized to help strengthen the injured regions thereby making corrections more stable. Then you can begin a natural, drug free approach to regain your health. The typical patient will encounter 3 stages of care. The first stage focuses on symptomatic relief such as reduction of pain and other discomforts. The following stage addresses tissue healing and function normalization. The final stage consists of periodic spinal care to prevent the formation of new injuries, minimize future flare-ups of old injuries, and prevent degenerative spinal processes from occurring. Relief care (or crisis care) is the first stage of care for most patients. The primary goal during this initial stage is to provide the individual with symptomatic relief. Treatments focus on those techniques and therapies which most quickly and effectively reduce pain and other discomforts. This will allow the majority of individuals to continue their activities of daily living. Patients are generally recommended to "take it easy" but are encouraged to stay mobile and functional so long as there is not a risk of further injury or tissue damage. Therapies that reduce inflammation and muscle spasm are also used during this stage when present. The second stage of care consists of correcting the problems which caused and contributed to the condition and healing and rehabilitating the injured tissues. Unless these events take place, a favorable outcome is unlikely and future recurrences of the problem are likely. It is extremely important that the patient comply with and follow the instructions given by the chiropractor during this stage of care. Tissues and structures that are not fully healed and rehabilitated are prone to future problems. Sticking to appointments, complying with home exercises and instructions and following all other recommendations will help insure this occurs. Patients should also be aware that once pain and discomfort have subsided, tissue healing and functional correction is many times still incomplete and will often require additional treatments. Once the spinal tissues are healed and spinal bio-mechanics have normalized the patient will be recommended to continue with periodic spinal checkups. For some this might mean once per year, for others this may mean once per month or more. Chiropractic spinal checkups provide similar benefits to the spine that dental checkups provide to the teeth. Namely, catching minor problems and disturbances before they have the opportunity to cause pain, discomfort and tissue changes. With the 3 stages of care mentioned above it should be noted that the treatment stages as well as frequency of visits vary from patient to patient. As a rule: We encourage the patient to get better sooner, with the least amount of visitations.